How to deal with the ever-increasing problem of space debris, poses a major challenge for space agencies, industry and academia around the globe. 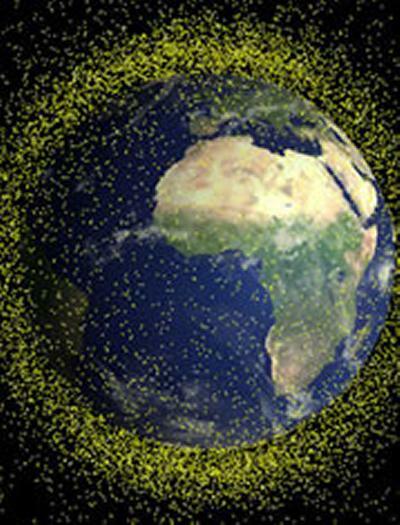 Now, research by a team from the University of Southampton's School of Engineering Sciences, suggests a new technique for identifying key pieces of debris that should be targeted for removal from orbit. Using network theory as a mathematical tool to identify these key pieces of debris, the Southampton team's approach involves looking for objects that might cause damage based on how many potential links they have to other objects. That is, how connected they are in a network. The greater the number of links, the greater the object's potential for causing damage. The research was presented at the 59th International Astronautical Congress (IAC) in Glasgow this week by Dr Hugh Lewis of the University's School of Engineering Sciences. His presentation was based largely on work by Southampton PhD student, Rebecca Newland. "The space debris environment can be thought of as a network in which the pieces of debris are connected if there is a possibility of them colliding," explains Rebecca Newland. "Once a network has been built it can be analysed to identify objects that are important to the overall structure of the network. "To destroy a network it would be necessary to identify and remove those key objects, in the same way that targeting highly connected routers for removal could cripple the internet." Space debris consists of any man-made object that no longer serves a useful purpose in space. Examples include redundant satellites, used rocket bodies and explosion or erosion fragments. Even small pieces have the potential to cause damage if involved in a collision, as many are travelling at speeds of around 10 kilometres per second. "Previous modelling studies have suggested that even if no new satellites were launched, the number of objects orbiting the Earth will continue to increase as a result of predicted collisions between existing objects," comments Dr Hugh Lewis. "For this reason, it is important to identify debris objects at risk of collision when making plans to 'clean-up' space. "Objects need to be ranked according to the risk they pose so that they may be chosen for removal, and this is what our research aims to do." Networks have been studied extensively in recent years as there are many that we rely on in everyday life from neural networks to the internet. The research was undertaken by Dr Hugh Lewis, Rebecca Newland, Dr Graham Swinerd and Arrun Saunders at the University of Southampton.